At our son’s preschool for Valentine’s Day they gave all of the parents hearts to take home and write on what our favorite things are about them. I decided to take this opportunity to play around with my Silhouette Sketch Pens. To make the words into a heart shape, I found a heart shape and then dragged the text onto it. The images in the text are just dingbats from various fonts that I had around. 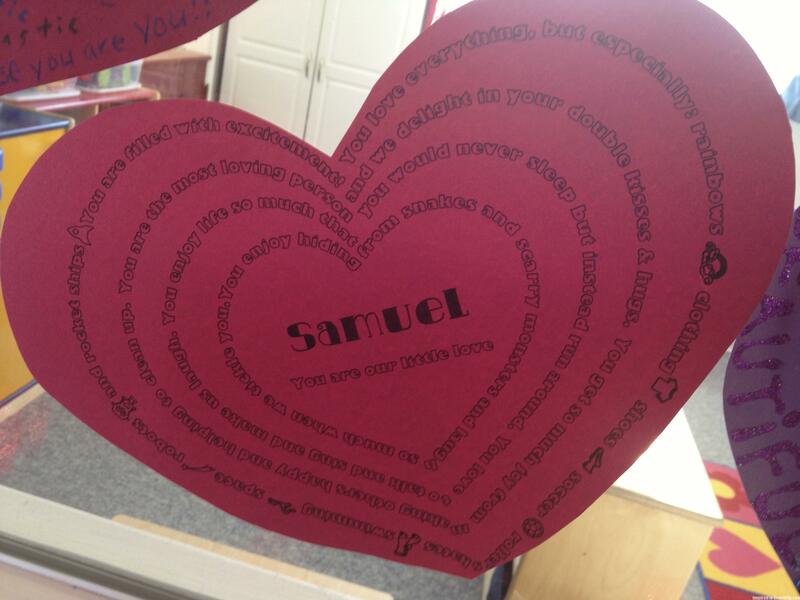 Then I made several hearts of decreasing size and placed each of the lines of text on it. If I did it again I would probably skip the dingbats. Then all that needed to happen was to put the heart on the mat and replace the cutting blade with the pen and change the settings in the software and “cut”. You are filled with excitement! You love everything, but especially: rainbows, clothing, shoes, soccer, roller-skates, swimming, space, robots, and rocket ships. You are the most loving person and we delight in your double kisses & hugs. You get so much joy from making others happy and helping to clean up. You enjoy life so much that you would never sleep but instead run around. You love to talk and sing and make us laugh. You enjoy hiding from snakes and scary monsters and laugh so much when we tickle you.